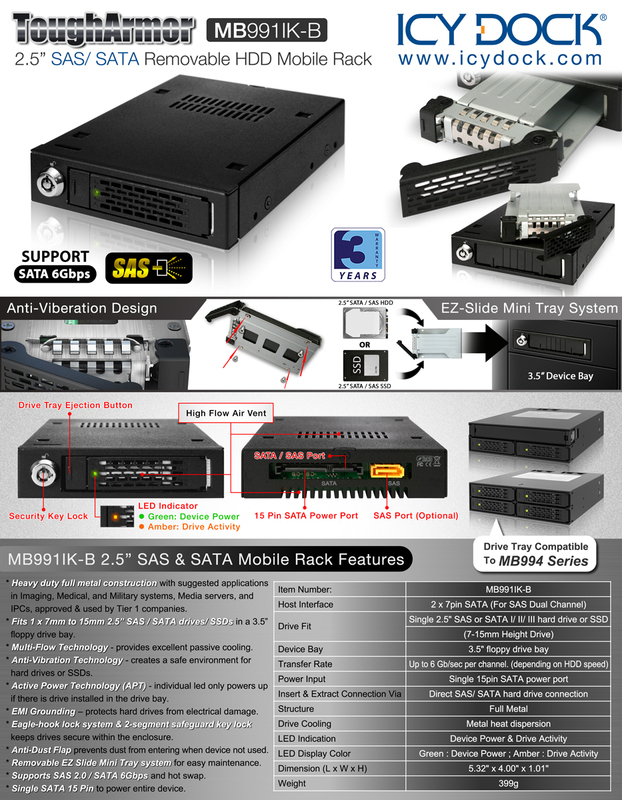 Introducing the Icy Dock ToughArmor MB991IK-B 2.5″ SAS / SATA Mobile Rack solution for use in 3.5″ device bays (Floppy bay). The main purpose is to provide a small form factor device built specifically for systems in a small real estate to work with, specifically for 2.5 SAS hard drives or SSDs. Because of the high performance and reliability factor of SAS drives, it is crucial for the storage solution to be just as sturdy as the drive being used. By using heavy duty metal construction, it is capable to withstand the harshest enterprise type environments. The drive is fully secured by our proven technologies such as, the Eagle-Hook lock system and metal 2-segment safeguard key. Our full metal EZ Slide Mini Tray allows interchangeability of data between multiple systems with other compatible ToughArmor products. Suggested applications in Medical & Military systems, Media servers, and IPCs, approved by Tier 1 companies.